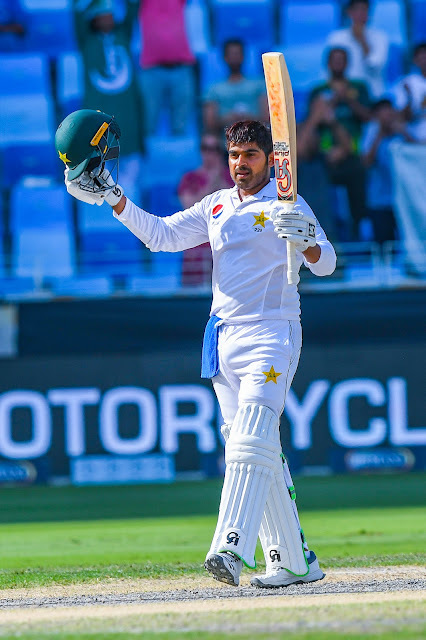 On day 2 of the first test against Australia, Pakistan further solidified their position through a 150 run partnership between Haris Sohail and Asad Shafiq. In the process Haris Sohail posted his maiden test hundred, scoring 110 with 8 boundaries and two sixes. Haris has been in and out of the Pakistan team across all formats since he made his debut. He has an impeccable first class record, where he is among very few Pakistani batsmen who average above 50, and now he has finally showcased that potential at the international stage. Haris addressed the media at the end of day 2. You can view the video clip of his press conference on our facebook page. "I got out in 30s a few times during the series against England. I wanted to come out and make a big one. Thankfully I have achieved it." "When you score your maiden Test ton, it's an indescribable feeling .When I reached the milestone, it felt very different." "It means a lot. When you are playing for your country and score your maiden hundred it means a lot. You talked about my knee surgery; I have struggled a lot due to my knee injury. I worked very hard to come out of that phase. Thankfully I am out now." "Our target was to get in excess of 450. This is a difficult wicket to score runs on. It's a slow surface. The outfield is slow as well. I think it's a pretty good score." "I am a humble man (laughs) If they tried to take a dig at me or sledge me, I didn't even look back at them. They tried to sledge a few times. I ignored it." "I worked a lot on my bowling with the coaches. If I get an opportunity, insha'Allah I'll try to do well." "At one stage the seam had worn out, they were delaying to take the new ball. It was so soft that scoring runs had become really difficult. The ball wasn't travelling at all, even when it found the middle of the bat. The plan was to stick around and wait for the new ball. Eventually when they opted for the new ball, the runs started flowing." "There were a few spectators in one corner. I could clearly hear them call out my name and cheer me up. If it's a full house you can't really hear the crowd clearly (laughs)." "One of the reasons behind sending me at number four was to play with a left hand, right hand combination. They have Nathan Lyon and a left arm spinner (John Holland). As far as Younus is concerned, we all know he is a legend, I hope I can be a shadow of how good he is." "As I told you before as well, I got out in the 30s against England. Sometimes I got a good delivery on other occasions I threw my wicket away, in panic. I was trying to stay calm, and come out of that phase. My main target was to avoid the panic button. As I moved out of that situation, runs started flowing for me. "